**Note: **The hardware reset pin of the RN-42 module is broken out on the bottom side of the board. This pin is mislabeled as 'PIO6', it is actually PIO4. Should you need to reset the Mate, pull this pin high upon power-up, and then toggle it 3 times. FCC Approved Class 2 Bluetooth**® **Radio Modem! Is this module capable of being a "Master"? I want to use an arduino to read bluetooth bike sensor data(HRM,CPP, and CSC), and relay that to a screen. 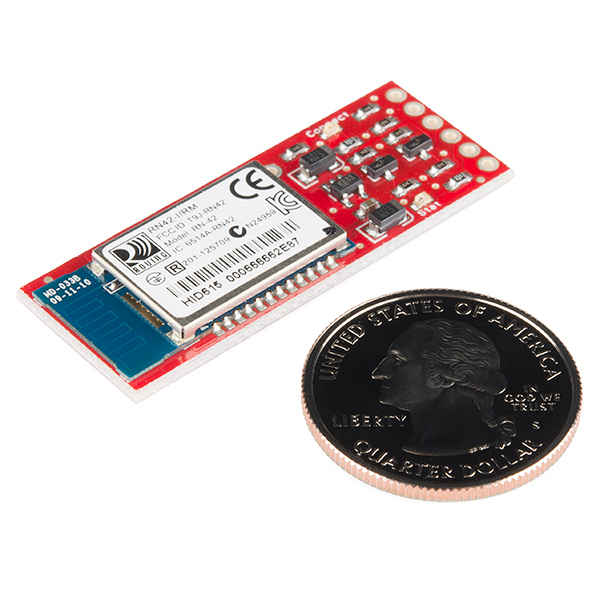 Does anyone know if this is the smallest bluetooth modem out there, at least easily usable? For anyone attempting to use this with a Pro Micro and blindly following the Hookup Guide provided above to test out your new toy, please note that the Pro Micro follows the same pin limitations as the Leonardo, listed at http://arduino.cc/en/Reference/softwareSerial, so pin 2 will not work for RX with this module! I'm using an Arduino Micro (not the pro micro) and i can't get pin 2 to work as RX, I assume this is the same problem? If so, what pins can i use as RX? Thanks. Check out the Software Serial Library it tells you which pins you can use. Also, keep in mind that the Leonardo and Pro Micro have the USB connection separate from the hardware serial line meaning you should not need to use software serial (just use Serial1). If you want to use software serial you still can, just check which pins you are using. does this work on the lilypad ? I also tried it on UNO but does not power up. from the UNO i am passing a 5V. The UNO is powered by USB. Once the UNO gets working i want it to work on lilypad. I successfully set this to master mode and connected to a device. How can I disconnect with it? I read something about I can use SO,<string> and with the first character of that string, I'm able to disconnect, but I don't think it receives any commands after I have connected to something. At least it doesn't respond anything for any commands after the connection has been established. What can I do to disconnect? I want to connect this board has a max3072 (RS485), but RTS pin of the board hasn't never a high level .why? That's a MOSFET (N-Channel) as it's labeled in the schematic. Are you looking for a specific part number or something else? It's the MOSFET BSS138 N-Channel. Hope that helps! Having difficulty getting back to factory default. It started out in serial SPP but I must have messed up the config via the $$$/CMD mode because now it is recognized by all receivers as a keyboard and I cannot get it back to talk to me. I've tried the GPIO4 reset process, shorting the pin to VDD (pin 11) and toggling 3 times, but no go: It powers on with the quick flash saying its ready to reset, but then promptly goes to the slow blink, apparently not waiting for me to toggle the pin. Any suggestion? I am attempting to connect two of these modules. I have previously been able to get them to connect but I had an "issue" and might have sent bad commands. So, I reset the modules back to their factory settings. Since then, I haven't been able to connect the two modules. I have been able to search and find the both devices. I can store the address of the device but when I try to connect, I am unsuccessful. Any suggestions? I FOUND THE SOLUTION: It appears that when I received the modules that they were set to (SA=0) and when I did the factory reset they were set to (SA=1). By changing to authentication to "SA,0", I was able to connect the two devices without sending the pin or any info confirming the pairing/connection. Another side note... I started having issues when I used the factory setting reset command (SF,1). I still am unable to connect the two modules. However, I have been able to connect my phone to each of the modules but I can't get the two modules to connect. I have tried putting one in master mode and one in slave and that was unsuccessful as well. For a project I need to make a network with 4 arduino's. Is it possible for this module to be connected to multiple modules simultaneously? So I can have 4 arduino's each whit its OWN bluetooth transceiver all talking with each other? By definition Bluetooth doesn't really do networks bigger than 2. this is why its actually referred to as pairing. So you can get 2 devices to talk but not really more than that. If you need 4 I would look into XBee modules. My unit never seems to leave the config timer mode -- the stat LED is constantly blinking at 2 blinks/sec. Is there something I can do about this? Can I connect multiple Bluetooth device like this with my PC. I mean I am trying to collect some sensor data in wireless manner using Bluetooth. If this device uses serial protocol, how can I discriminate the signal from many sensors which are using the same serial communication? Thank you in advance for your answer. Do I need to have a bluetooth dongle to hook up to my computer if my computer is bluetooth capable? Also, I believe that you will need a USB hookup for your arduino board if you are programming it for the first time. I learned that the hard way. No, you do not need a bluetooth dongle if your computer already supports bluetooth. I have connected my laptop directly to the Bluetooth Mate which I have connected to an Arduino Pro Mini. I can successfully communicate serial data between the arduino and my laptop, but I can not program the arduino via bluetooth (as you mentioned). I believe the key is that the RTS line from the bluetooth module is simply to control serial flow between the bluetooth module and the arduino (i.e. no relation to the laptop's RTS state). What we really need is GPIO10 (DTR) routed to DTR on JP3 so that the arduino IDE can reset the arduino board. The bluetooth module's UART_RTS (which is routed to JP3) is not the same as GPIO11 (RTS, but driven by the remote PC). Similarly, GPIO10 is DTR, but driven by the remote PC. There also seems to be some discrepancy between the Bluetooth Mate PDF and the Roving Networks documentation as far as pin numbers. The Bluetooth Mate PDF says it's using the RN-41, whereas the board now comes with the RN-42. Great product. I am a beginner, and I was able to communicate with my android smartphone by following the Hookup Guide in just an hour. I'm using an Arduino Pro Mini 5V, and the app "Bluetooth SPP" on my phone, which is a simple bluetooth serial terminal. Is it possible to make a connection with an android phone. WITHOUT having to open another application on the phone? My goal is to have tasker notice when the bluetooth device has been activated, and than run a script on my phone. So far I don't think I can do that with this device, and that makes me upset. By default this device is in SPP, I want to put it in HID mode so it connects automatically. From there it now connects to my phone automatically once paired. Can I use this product to plug into the console serial port of a BeagleBone Black? If not, can I add a TX/RX switching PCB to do this? Can I use this on a Raspberry Pi? If I have the right TX/RX setup and FTDI board (one used for arduino) can I hook up the FTDI straight to the GPIO pins on the pi? You can, but it seems backwards. I would either use the I/O pins on the Pi and skip the FTDI board or get a cheap Bluetooth dongle and skip both boards. But hooking the FTDI to the GPIO pins on the Pi seems like a crazy loop. How would one go about connecting this to an Uno R3 board (as a serial connection, not with virtual serial)? Also using a motor shield, building a simple BT rover with it. If you're using the hardware serial port, be careful about leaving the BT module connected when you're uploading code. I'd recommend disconnecting the Mate's RX line when you upload, to make sure it doesn't receive any data meant for the Arduino. Alright, thanks; another question is if it can be used to directly interact with a sketch directly via serial, not particularly experienced with the programming side of 'bot building. Does the price consist shipping cost? 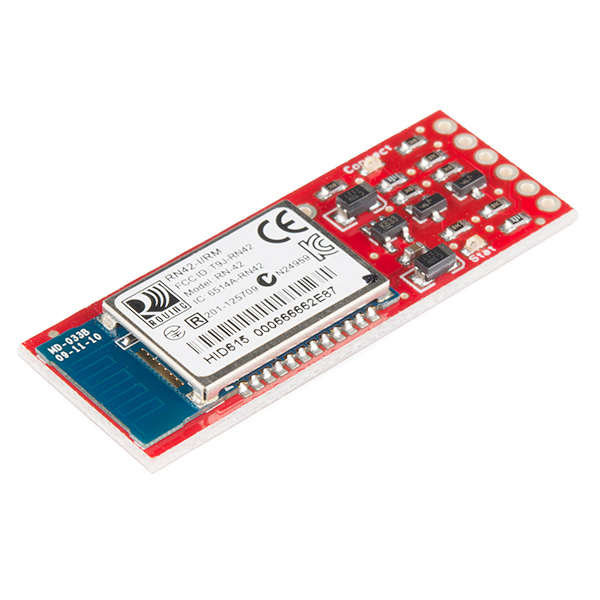 Will it hookup directly to a Arduino Pro Mini 3.3V as well? Sure! It's designed to work at both 3.3V and 5V. It took about 4 minutes to solder in a header, apply power, pair the device with my Galaxy S4, send data, and confirm using oscilloscope. It just simply works..... Could not ask for anything more. If you wanna mess around with bluetooth, this board is great for it. I like the fact that it runs on 3.3v for those processors that are not 5v tolerant. I didn't dig into the datasheet for this, but it was easy to find. Improvements: Not sure, but tx and rx leds would be a nice addition. Really easy to hook up once you read through the user manual. 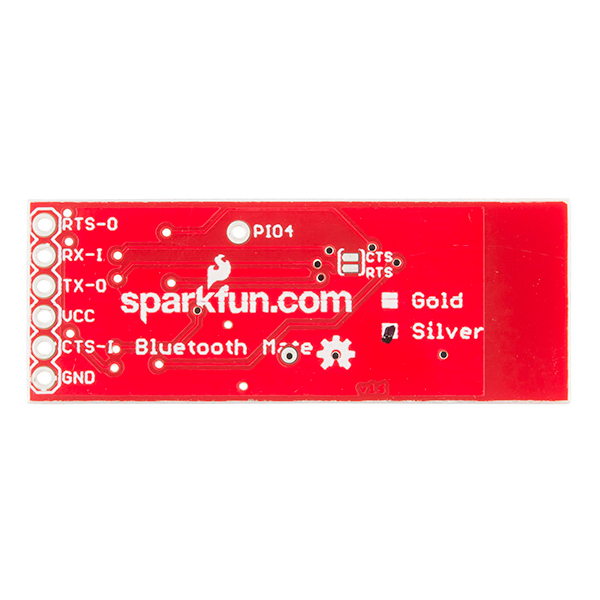 SparkFun Bluetooth Mate Silver... Works beautifully! I have been painfully frustrated trying many Bluettoth modules with my Arduino Uno, but so far this little Mate is the easiest to configure and useâ¦ I definitely recommend itâ¦ Can't wait to try the Mate Gold! My only complaint would be that it would be immensely useful to have the GPIO pins individually terminated to ground with pull-down resistors and provide solder-bridge pads to strap them to a logic high. This would allow using the hardware control modes, which would greatly simplify reconfiguration once installed in a device. It is vitally important to have independent access to GPIO4 in order to be able to perform a factory reset of the device. Otherwise, this device is nothing but GREAT! 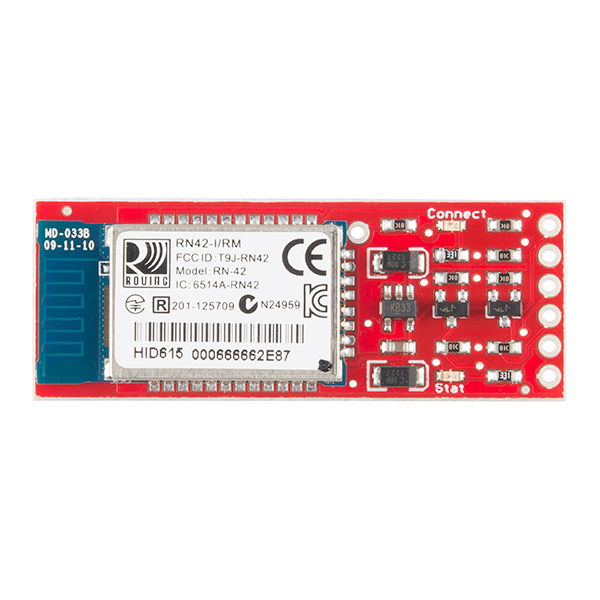 Connects to the microcontroller with AT commands pretty easily. Bluetooth connection is stable. Cheap way to get bluetooth on your controller. When combined with a RS-232 to TTL/Cmos Converter it is even more useful for building interfacing between Serial ports with differing Logic levels. So I am happy to have one of these available in the tool box. Combining these two functions on one breakout board and adding a small modular case and DB9 connector would be great. I use this with a Samsung phone to control/steer an autopilot on a sailing vessel. An ASCII command sentence is passed via the bluetooth mate to the autopilot and the boat takes the appropriate action. Range is at least 30 ft. Data seems not to be corrupted in our testing to date. It works perfectly with my Arduino board. Easy to set up and use in conjunction with the Arduino Pro. Super easy to program. All the docs say to simply send "$$$" to enter command mode, and while that works from the terminal, it never worked when sent from an Arduino program. I spent the better part of a day pulling my hair out while trying to debug everything that I could think of, even down to the UART logic levels with my oscilloscope, under the belief that it wasn't properly receiving what the Arudino was sending to it. Turns out that there's an undocumented quirk: You need a slight delay between sending each '$' character. Doing three individual Serial.print("$") calls worked for me, while a single Serial.print("$$$") consistently failed. For good measure, I later threw a delay(20) between each one as well.